Add the nuts and basil to a mini food processor, and blitz until well chopped. Cook the diced halloumi in a dry frying pan for a few minutes on each side, over a medium heat. At first the halloumi will release some liquid, and once that has cooked off, it will become golden brown. Transfer to a bowl, and set aside. Heat the rapeseed oil in the same frying pan, and add the diced mushrooms. Cook over a medium heat for around 5 minutes, stirring occasionally, until soft. Turn the heat down low and return the halloumi to the pan, along with the basil mixture and the crème fraiche. Season and mix well until the crème fraiche has melted into the mushrooms. 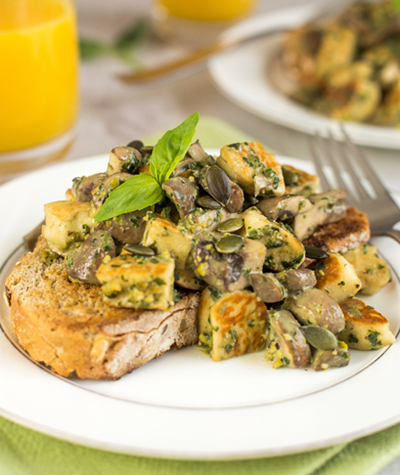 Serve warm on wholemeal toast, topped with pumpkin seeds or extra pine nuts if desired.